I’m ready to deck the halls with holiday cheer this season and have the perfect project for you! 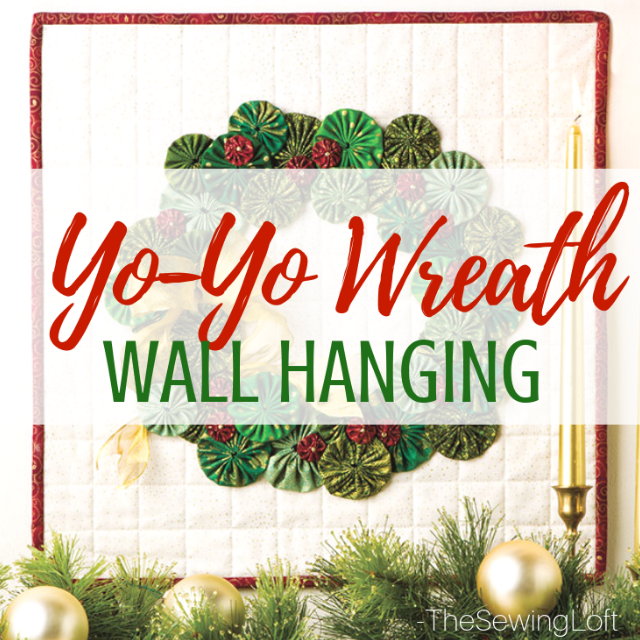 The Yo Yo Wreath wall hanging. 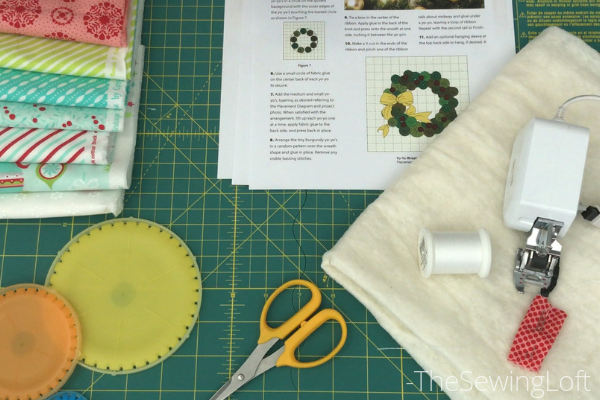 Not only will it use up your fabric scraps but it highlights a classic shape in the sewing world. For anyone new to Yo Yo making, don’t worry, I’ll walk you through it. I’ll show you step by step how to create yo-yo’s in all different sizes. Then once you have the technique down, we’ll layer them altogether and create yo yo wreath wall hanging. Since this is my latest class with Annie’s Creative Studio and captured on video, you’ll be able to hit the pause and rewind button anytime you need. 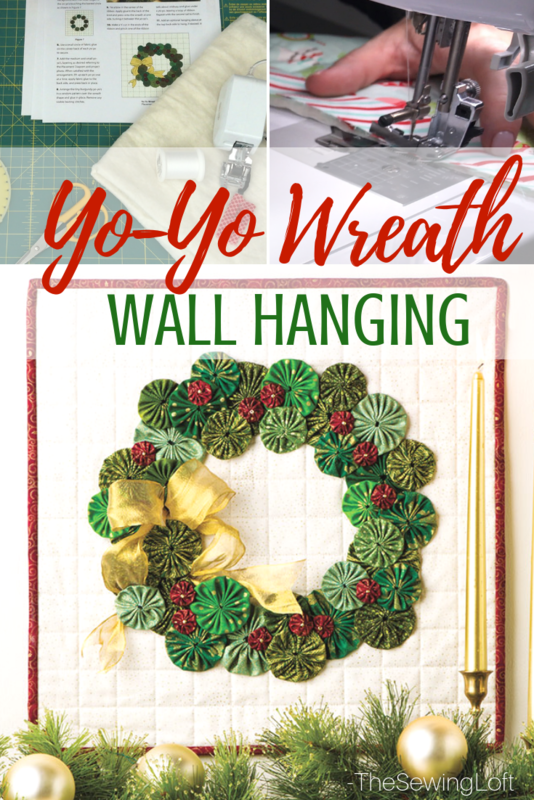 The finished Yo Yo Wreath wall hanging measures 18″ x 18″ finished making it the perfect size to hang on your mantle or door during the holiday season. Make yo yo’s by hand and with the Clover Quick Maker. Quilt in a grid pattern with ease. Create a layout using an everyday household item. 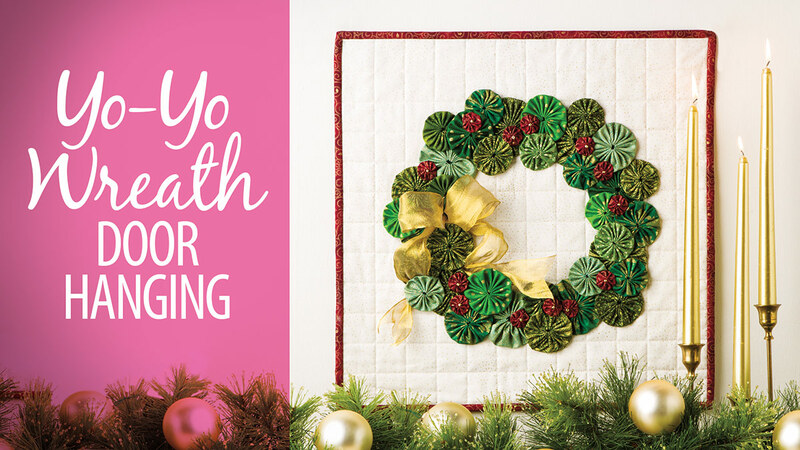 To follow along with me in class and complete this Yo Yo Wreath you will need to gather a few supplies. *Fabrics used in class are from the Vintage Holiday line designed by Bonnie & Camille. I’ve chatted about Annie’s Creative Studio before but if you haven’t checked them out yet, now is the time! They offer over six programs that include more episodes of exclusive content than I can count and tons of tutorials and tips from instructors all over the industry, including me! Plus, there are hundreds of patterns for you to download. Each week, new episodes are added to the website along with tons of patterns to keep you inspired! 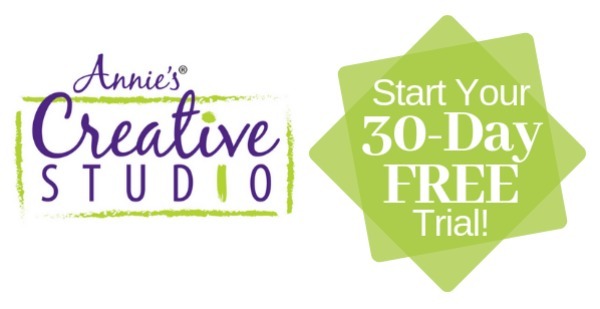 Your membership to Annie’s Creative Studio includes an all access pass to the instructional videos 24/7. That means no matter what time of day it is, you can stitch with me! All of Annie’s Creative Studio episodes are presented in an HD video format by well-known craft experts from all over the world. Quilter’s Skill Builders Master quilting techniques and patterns. Quick Stitches & Tips Skill-building in crochet, knitting, quilting, sewing, beading, cross stitch and more. Learn, Make, Create! New skills in crochet, knitting, quilting and sewing. Creative Living Trends, home decor, holiday entertaining, recycling and fashions. Crochet Skill Builders Crocheters of all skill levels will enjoy technique-focused episodes and crochet-alongs. Knit and Crochet Now! The complete eight seasons of the TV show featuring demos and free patterns. Products We Love New craft products. So what are you waiting for? Come stitch a few Yo-Yo’s with me and start your free 30-day trial membership today! Remember after you sign up you’ll have access to all of my classes including the Tis’ The Season Quilt and Cathedral Window Ornaments. How thick or deep is the wreath? I’m just wondering if it would fit on the outside of my front door without touching the storm door. That way, it won’t be as exposed to the elements and will last longer. I’m worried that, if it touches the outer door and gets wet, it could freeze to that door and then potentially rip when somebody opens the door. That’s a great question. My wreath is about 3/4″ – 1″ deep but that’s with a flattened bow. I’m not sure how much space is between your doors but it would fit between mine without touching. If I join the trail program will I get pattern for the yo-yo wreath? Is it only available through joining?Thanks!! Yes, the pattern is part of the Annie’s Creative Studio library. You can find it and many others there.